Trinity Place is a landmark destination where art and life merge into a lifestyle you’ll only find in San Francisco. Three exquisite residential buildings with San Francisco apartments designed for you surround a glorious Piazza that will offer convenient access to shops, restaurants, bars, cafes and a welcoming urban park. The Piazza will take visitors on an artistic odyssey inspired by the most beautiful sculptures and art installations of the classical period. 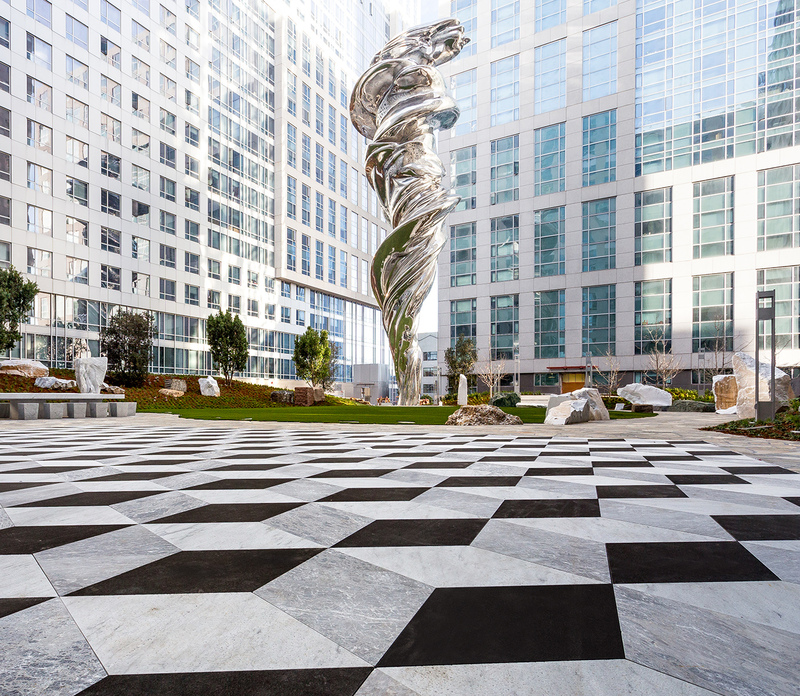 The one-acre Piazza, which will eventually serve as a new pathway between Market and Mission streets, has become the permanent home of a singular collection of sculptural art designed by renowned artist Lawrence Argent. The centerpiece of Trinity Place’s Piazza is a spectacular 92-foot stainless steel sculpture, Venus, which is San Francisco’s tallest sculpture and only slightly shorter than the Statue of Liberty as measured from heel to crown. The installation in its entirety is entitled C’era Una Volta – “Once Upon A Time”. C’era Una Volta is an art installation comprised of many parts woven throughout the site, transforming it into a place of mystery and unfolding meaning. Inspired by classical icons of beauty and the stone quarries from which these ancient sculptures were made, C’era Una Volta re-envisions and abstracts classical forms using contemporary digital technologies. Historical fragments appear in transformed ways throughout the central garden and walkways. For people who are truly looking for it all, Trinity Place is the natural choice. When completed, this fabulous residential community will offer four high-rise apartment buildings designed by internationally acclaimed architectural firm Arquitectonica. Trinity’s elegant San Francisco apartments for rent feature quality finishes, generous walk-in closets, modern kitchens with high-end appliances and stone countertops, large windows, high ceilings and solid soundproofing. With more than 65,000 square feet of planned retail space, Trinity Place will provide convenient access to the city’s finest dining, shopping and other services and it’s all right outside your door! 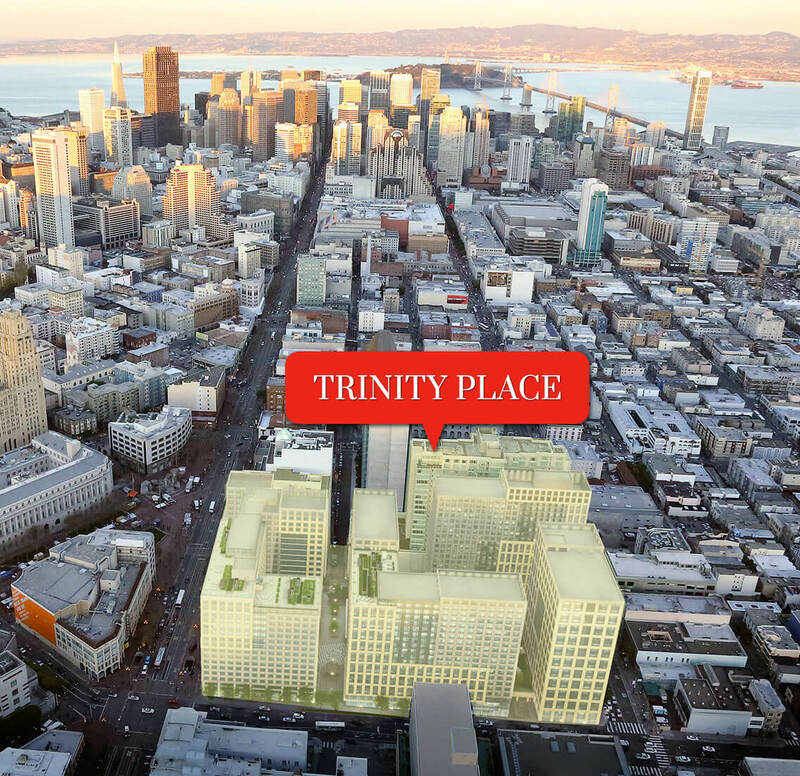 Whether you are searching for a beautifully appointed San Francisco apartment for rent , retail shops to create the store of your dreams or simply somewhere to park your car, Trinity Place has it all! Let us know what you want and we’ll get back to you in a flash. Our knowledgeable agents are on call 24/7 to help you get exactly what you want. Thank you for your interest in Trinity. One of our knowledgeable agents will be in touch with you shortly. Start getting excited...Trinity is in your future!